You managed to grow your Spinach seeds from tiny little seedling to a plant that looks like something Popeye would eat. You might not be certain how to harvest spinach. Maybe you want some baby spinach leaves and not the crinkly matured ones. How do you know when spinach is ready to harvest? You will want to pick the spinach leaves when they are ready to eat at peak time. The spinach plant is ready when the leaves are fully developed (depends on variety), but definitely before they bolt. Check your seed packet for information specific to your variety, but generally, the leaves will be 4- 6 inches. It is best to start harvesting leaves from the outer plant to encourage regrowth. Harvest them too late and they will be bitter. Harvest spinach leaves too much and you might not get a regrowth. Bolting– It is a term that simply means that the plant has moved onto flowering and reproduction. Check out our monumental guide here to growing spinach if you want more information. Eventually, you will have spinach leaves that are about four inches long with several sets of leaves on the plant. This is ideal for the savoy or more traditional spinach you see in grocery stores. Below you will find a few different scenarios of the best times to pick your spinach plants. 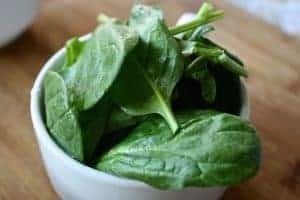 Basically, there are 3 different types of spinach plants that will be discussed – Savoy Spinach, Flat leaf or Smooth Spinach and other spinach-like plants. Baby spinach is typically grown with spinach varieties that are smooth leafed. This type of spinach has a flat or smooth leaf surface. Typically, this type of spinach is used in salads and cooked in other dishes. You may begin to harvest these baby spinach leaves in about 2-3 weeks after transplanting. You may be able to harvest some of it even before that time period, but you should expect to harvest the first cuttings in just under 1 month. You want to start picking the outer leaves and make sure that you leave about 1/3 to 1/2 of the spinach plant in place if you want it to regrow. The other option is to just pull up the plant and harvest all of the leaves if you don’t want any regrowth of the spinach plant. We have found that cutting the entire plant and leaving about an inch above the plant does also grow back, but it takes longer. Experiment what way works for you in determining the perfect time to harvest your spinach leaves. Our methods are more intensive with spinach plantings that we discovered through trial and error. 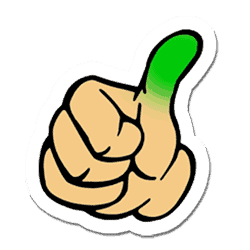 We like to really seed more than most and find that our yields are much larger when we do this. Discover what works best for you. The large savoy spinach leaves are ready to pick at about 4 weeks from transplanting. Savoy spinach varieties are the leaves that are crinkly or leaves with lots of folds in them. The spinach leaves are almost bunched up. This type is perfect for sauteing, cooking or freezing, but not typically used in a salad. This type of spinach grows from the center so the new leaves are going to start out really small from the center of the plant. The larger spinach leaves will slowly become the outside leaves as the spinach plant grows larger. New growth emerges from the center of the spinach plant. Your spinach plants are ready to harvest when the leaves are about 4-8 inches in length. You will look at the outside perimeter of the spinach plant and look for the bigger leaves that are ready to pick. You can either cut or pull up the entire plant at this point. You may also just take clippings of the outer leaves as well. There are a few other plants that are similar to spinach plants but are not really the traditional spinach. It is prudent to mention them here, so you can know about harvesting this type of “spinach”. The two types that we are talking about are – New Zealand Spinach and Malabar Spinach. New Zealand Spinach is typically planted in the summer or more temperate times of the year. This type of plant is best to grow on a trellis as it does spread out quickly. You will begin to harvest the spinach leaves individually at about 3 – 4 weeks after transplanting. Malabar Spinach is also a plant that does well on a trellis as it vines. This plant does take much longer than the New Zealand type, so you may not be able to harvest until 5-6 weeks. This plant also prefers a warmer climate, so it can be planted during the summer time. Both of the types of plants that are grouped with spinach are perfect for in between the spring and fall crops of traditional spinach plantings. You can harvest both of these types all throughout the summer. They both have a mild spinach flavor and can be used in many dishes that call for spinach. Spinach Bolting- Does my Spinach Plant run away? Your plants have been growing for about 2 months and you may have been harvesting spinach leaves. But as time goes on, your spinach will send up a long thin stock that comes from the center of the plant. The leaves you have been harvesting may not taste sweet anymore, but begin to taste bitter. This is the flower stalk of the spinach plant. This is a flower head which is going to turn into a seed head. Once your spinach plants bolt, the whole structure changes and it’s really time to pull them out of the garden. You can let it continue to grow if you want to save seeds though. It is important to know when your spinach plants bolts because this is really the end point of when you can harvest spinach leaves. The process of forming this stalk redirects the energy of the plant leaf growth. This redirection of spinach plant energy really makes the spinach leaves tougher and more bitter tasting. You can still harvest them if you are just seeing the stalk form but do it quickly. Typically, the spinach plant bolts when the temperatures warm up and the days get longer. This signals the spinach plant that it is time to reproduce. Some varieties of Spinach may be slow to bolt, so pick these types if this a concern for your area. Hand harvest outer spinach leaves when they are ready. This may vary accordingly on to your preferences. Always take a taste of the spinach leaves to see if they are to your liking. Snip off with shears or scissors. You can clip off the entire plant and leave an inch at the bottom to get another regrowth. You can also cut off the outer spinach leaves to also promote growth. Pull the entire spinach plant. This is recommended if you notice the plant is bolting. This will hopefully stop the bittering process and you can harvest the spinach leaves at that point. Hopefully, you found some of the best ways to harvest your spinach leaves. Picking spinach at the right time is subjective as your taste and needs may vary. Just don’t be afraid to try different picking times to see how the taste may vary. Another cool thing to do is plant spinach in containers. You could have different varieties of spinach and pick them all at different times. Check out this post here about planting spinach in a container for more information. 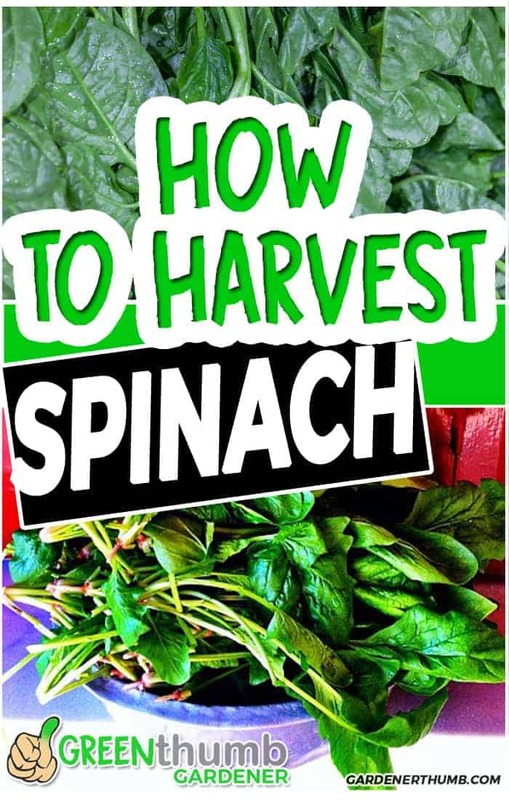 Can you harvest spinach multiple times? – Yes, you can if you cut the outer leaves or if you cut and leave at least 1 inch from the stem. Can you harvest spinach after it bolts? 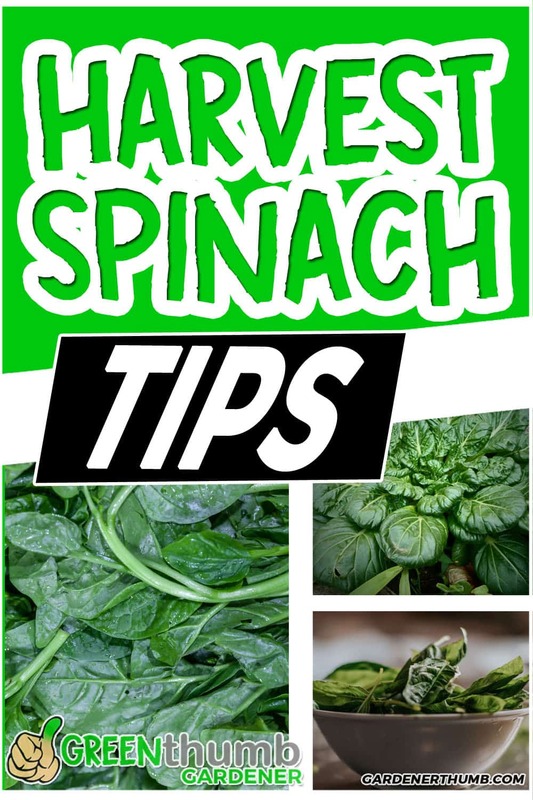 – Typically, you can only harvest spinach leaves if you catch it just as the stalk is forming. however, it may taste bitter, so check the taste before you do.